Provide fresh vegetables, hay, pellets, and water. See our Diet page for more info. Clean your guinea pigs' cage. See our Caging page for details. Weigh your guinea pigs. A kitchen gram scale is adequate. Catching gradual weight loss early before your guinea pig is seriously ill is essential, and often weight loss is an early sign of illness. A printable weight log can be found here. Check front teeth alignment and length to make sure they are aligned properly and not broken. For an example of the importance of healthy teeth, please see Popo's story. Feel their bodies to look for lumps or abscesses. Check pads of feet for chafing, redness or sores. To maintain healthy feet, keep cages clean and dry by changing cage bedding every week and spot cleaning any wet areas in between cleanings. 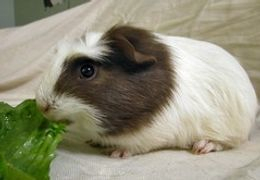 Guinea pigs should never be kept in wet, soiled bedding, as this may lead to serious conditions such as bumblefoot. Trim nails regularly to prevent foot problems. If you live near the rescue, we will trim nails for you for a small $5 donation per guinea pig. A great resource for do-it-yourself piggy nail trims can be found here. Trim hair around your guinea pigs' bottoms if that area is continually soggy, especially on longer-haired breeds. 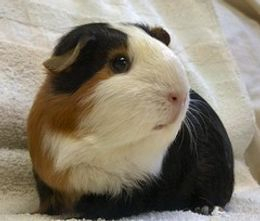 An annual vet check up by an experienced guinea pig veterinarian is strongly recommended, just as you would do for your cat or dog.